Our epic journey to Pluto has been filled with cosmic coincidences. Crossing Neptune’s orbit 25 years to the day after Voyager 2. Zipping by Pluto 50 years on the nose after our first Mars encounter. But my favorite serendipitous fact of all has to do with how we’ve powered the entire New Horizons mission—using none other than plutonium. Large spacecraft such as the ISS use arrays of lightweight, highly efficient solar panels to generate electricity. But three billion miles from home, sunlight doesn’t give us enough juice, which is why engineers have turned to radioactive elements to power deep space, exploratory missions. When it was blasted away from Earth in 2006, the New Horizons spacecraft contained roughly 10.9 kilograms (24 pounds) of plutonium-238 oxide pellets, a radioactive isotope that decays naturally with a half-life of 87.7 years. 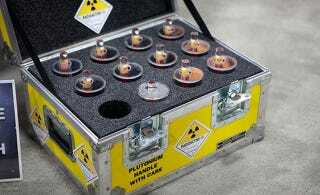 As plutonium decays, it releases large amounts of heat energy. Inside New Horizons, plutonium pellets are surrounded by thermocouples which convert that heat to electricity, powering the craft’s seven scientific instruments, its controls and communications system. All of the gorgeous images of Pluto and its moons we’ve been downlinking over the past several days, all of those fascinating insights about the dwarf planet’s ice mountains and geologic activity, these are brought to us by Pluto’s very own namesake element. And we’ve got enough of plutonium on New Horizons to keep our instruments up and running for the next ten years. For plenty more details on our plutonium-powered Pluto mission, a fantastically Doc Brown-styled narrator breaks it down for us.